Happy Friday everyone! My husband and I are headed out tomorrow for an overnight getaway to the Gaylord Palms in Orlando. I am SO excited! I’ll have a full recap of our visit for you posted next week. What are your plans for the weekend? Let’s get to the questions..be sure and share your answers below! 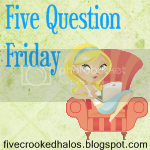 Just a reminder, I’m linking up with others for Five Question Friday and I don’t make up the questions. Click on the button above to see a linky list of others also participating. Where do you hide things from your kids? I usually hide things in my nightstand next to my side of the bed or the closet. And if I get really desperate – the trunk of my car! What is your favorite rainy day activity for bored toddlers? Lately, it’s been snuggling on the couch for movies. We’ve also gone to the library a few times when it was raining – tons of fun things to do there too! Are you a punctual person or always running a few minutes late? I feel like pre-children I was a pretty punctual person. It drives me crazy to be late, even if by a few minutes. With that said, in a life surrounded by toddlers, I always feel like I’m running late. When eating out, do you prefer off the beaten path cafes or tried and true national food chains? I love eating local and helping small businesses. And usually, the best food is at the off the beaten path type places. So, yes – I definitely love eating at those type of places. I’m always up for a good tried and true chain restaurant too though. Does your significant other snore? Do you snore? My husband snores like you wouldn’t believe! Oh my goodness, he is LOUD. I usually only snore when I’m sick. Or at least, so I’m told.